There is a myth that labelling an issue as one of 'national security' somehow removes it 'beyond politics'. Salus reipublicae suprema lex, the safety of the state is the supreme law, as the old Latin tag has it, and all must rally to the flag. Nothing illustrates the shallowness of this fiction better than Monday’s story by Amanda Hodge in The Australian. 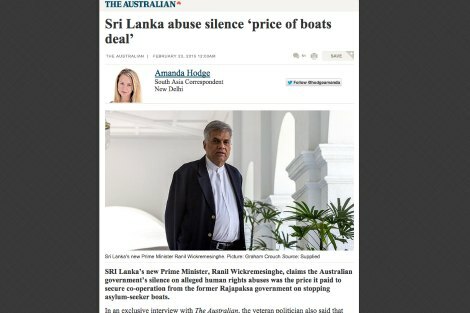 In it, she quotes the new Prime Minister of Sri Lanka, Ranil Wickremesinghe, as claiming that Australia’s silence on Sri Lanka’s appalling human rights record was the price for Sri Lanka taking extra measures to prevent people fleeing the country. In particular, the claim was that the Rajapakse government agreed to curb the involvement of parties linked to that government in assisting that flight and that Australia had cultivated relations with the government to the point where Mr Abbott refused even to meet a major opposition leader on his visit to the country last year. This is problematic on many levels. Australia, as a party to the Refugee Convention, has an obligation to grant protection to those fleeing persecution, rather than collude in preventing their flight. At a deeper level, though, it illustrates some of the major problems of seeking to remove human rights issues by reframing them as national security ones. By describing the prevention of asylum seeker arrivals as a national security issue (recall 'Operation Sovereign Borders', the militarised anti-asylum seeker drive and the secrecy which attends it, on 'operational grounds'), the Government has sought to wrap what are, effectively, political prejudices – even if they are shared by both main parties – in the cloak of national security. Who seriously believe that sheltering those genuinely at risk of persecution is a threat to national security or that the resulting lack of scrutiny is not very convenient for the Government? This clearly illustrates how very political the decision to frame an issue as one of 'national security' is. As the old saying has it, 'one person’s terrorist is another’s freedom fighter.' The fact that Australia has chosen to turn a blind eye to Sri Lankan government abuses of political and ethnic minorities in order to protect its own anti-asylum seeker program illustrates this point very neatly. The cost of these political choices can be high. In this case, the first cost is direct and comes in the form of damage to diplomatic relations when the political wind shifts. The same article in The Australian, scarcely a left-wing voice on refugee issues, notes that now that a new Government is in power, one which is seeking to ‘punish those who illegally profited under the Rajapaksa regime’s “crony capitalism”’, Peter Dutton would be 'unlikely to get the warm welcome received under the previous government'. The second cost, particularly where human rights issues are concerned, is less tangible. Australia’s treatment of asylum seekers has long been the subject of international criticism. As has been pointed out elsewhere in Eureka Street, our disregard for human rights in our offshore detention centres has made it difficult for other countries to take us seriously when we advocate for the protection of our own citizens. That includes the nations we kowtow to. The latest revelations about the Government’s dealings with Sri Lanka are scarcely likely to help in this regard. Justin Glyn SJ is a Jesuit presently studying for the priesthood. He has previously practised law in South Africa and New Zealand and has a Ph.D in administrative and international law. Thanks for this article; 'deals with the devil' is an apposite metaphor. It is worthwhile being reminded of one of the more disgraceful actions taken by the Government to 'stop the boats'. The Labor Party in government also turned a blind eye to Sri Lanka's woeful human rights abuses. Dubious deals for short term political gain continue to be done. We will doubtless face repercussions from the arrangements to transfer asylum seekers to Cambodia. Apart from the human rights considerations, it is surely deplorable that a rich country uses financial inducements to enable transferring its international obligations onto much poorer nations. Thank you for this summary of Australia's disturbing relationship with the previous Government of Sri Lanka. When Canada and other countries were condemning abuses in Sri Lanka, our own Government remained suspiciously silent. Many of us believed this was the price we were paying for co-operation in matters to do with asylum seekers, and it is now clear that this was so. This article raises disturbing issues. As I do not have specialist knowledge of these and the many other refugee issues that the country confronts and which Eureka Street highlights , I would be assisted by a better understanding of what should be done. What do the critics of the present policies say should be done about refugees who seek entry to Australia, and in particular: 1.Should the government cease stopping boats? 2. If yes, what should be done with those who actually reach Australia by boat and what benefits and other assistance should the government provide? There are many other questions that could be asked. However, my point is that , it is not sufficient to identify injustices(no matter how important they are)without indicating an alternative credible policy that Australia should adopt. How can we get some concern for disadvantaged people from our elected national government– for those suffering and disadvantaged both here and overseas & in particular, for people trapped in refugee camps here and overseas. I believe that a top priority for all Australians should be having a more compassionate & less doctrinaire person in the job of Australian PM and leader of our national government. Also we need firm undertakings by the alternative government (ALP) in opposition that it too would govern with more compassion for all of its citizens and with care and concern for refugees to our shores. We need to look out for, to the best of our ability as a more developed nation, our fellow humans overseas who lack the basic necessities of life we all take for granted in Australia. This, to our shame, is not happening now with the huge cuts made to the Australian overseas aid budget by our current national government.